This is the 14th income report as part of the zero backlink experiment. I took the last half of August and first half of September off to rejuvenate after a solid year of hustle! After last month’s epic tutorial I throttled back and only published 6 posts this month. One of which was the very first guest post on the blog – Ranking For Rand Fishkin – Blackhat Boosting 101. I also shared the epic Scrapebox tutorial by Jacob King and met $150/hour freelance writer Tom Ewer. I launched the Ultimate Demon competition with 3 lifetime licenses worth $1,191 up for grabs! Enter now if you haven’t already! In an effort to improve the site I have started to convert a couple of video tutorials into text/image based tutorials. Not everyone likes watching videos (ironically, I am one of those people) and it’s difficult to flick back through if you need to check something. So by offering tutorials in both image/text & video format solves that problem and makes them better for everyone! I have converted the How To Start A Blog and Buzzbundle tutorials so far. Check them out and let me know what you think – if you want to do the same for your own videos then contact these guys. On a similar line of thought I’ve also been planning a huge overhaul of the blog. I’ve been looking at introducing some new types of content and now have a pretty good idea of what I could do. Some you already know what 1 of them might be if you’ve been paying attention! As a blog grows and you add/remove plugins, try new things and so on things start getting a bit messy. Content also tends to take a bit of a hit over that time & there are always ways to squeeze more value out of what you already have. Social is only going to grow – so it’s time I grew with it and took advantage of more opportunities in this space! The site could also do with a bit of an upgrade here and there! It’s taken a lot longer than planned but my private SEO tool is pretty much ready to be released to the public! All that is left to do is put the actual site together. The software is done, all the resources I need are done, all the pieces of the puzzle are ready. I’ve just got to put the puzzle together now & get some people on board to help me promote it! The software will be 100% free for my readers and takes advantage of the only SEO tactic that has stood the test of time & algorithm updates. It automates what used to be a very long & manual process for me in the press of a button! Subscribe now to get my private SEO tool free of charge as soon as it is released! Last month I registered 50 domains based around my name with various extensions via NameCheap (you get free whois privacy). I have also extended this to social media profiles registering my name on as many as possible. You could use KnowEm ($649 / 300 profiles) or ClaimBrand ($279 / 300 profiles) for that. Or you could use the much much cheaper Social Foundations ($124 / 250 profiles) which is what I did. With all of the brand protection and social registration going on I updated my avatar! I was still using my old one and had a better one that played off my new logo. I also had the chance to shoot over to Nicaragua at the start of September! Traffic was down slightly this month with a total of 24,778 (826/day) unique visitors down from last month’s 27,288 (880/day). I haven’t really done any promotion work this month so that comes as no surprise! The top 100 blog post was top turnip again this month along with the ranking for Rand Fishkin post. We also saw good performances from the Scrapebox tutorial. Even Ultimate Demon sneaked in to the top 10 which was only published a few days back! Google Organic traffic reclaims it’s place at the top spot! 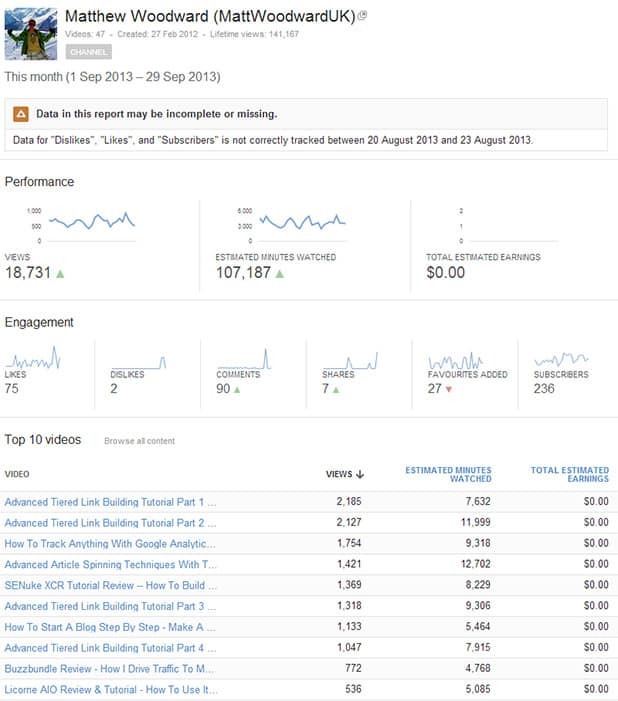 One thing I have done this month is kick off a new case study to improve YouTube traffic which is working nicely! More on that another time though! Still looking for help with sharing my how to build a top 100 blog tutorial – give me a shout if you want me to owe you a favour! Search traffic grew again this month rising to 18,214 (607 per day) from 16,147 (521 per day). I’m guessing the hummingbird update had a positive impact then! Although I did deploy a sneaky trick to try and boost search traffic on September 17th. Last month traffic came from 1,592 different keywords whereas this month it only came from 870 keywords. I suspect that is to do with Google’s switch to 100% not provided searches. I had 18,899 views last month which has remained steady at 18,731. Minutes watched also stayed roughly the same at 107,187 compared to last month’s 108,936. That means people spent a total of 74.5 days watching my videos last month! The blog has seen a total of 21,688 shares across Facebook, Twitter and Google+ this month compared to 19,139 last month. This month added 942 new users, 63 new topics and 186 replies. I’m suspecting there have been a bunch of spam sign ups though this month! Last month I managed to add a total of 1,711 new subscribers to the blog across the various channels. This month that has grown nicely to 2,175 which is a huge increase to 72 per day! There are now a total of 12,835 subscribers across all of the different channels. I did manage to scrape together 51 posts though! Like last month I took a lot of time off and refused consultation work earning a grand total of $00.00 compared to last months $00.00! Nice to see affiliate income remain steady while I was relaxing! After taking the most of the end of August off and the first 2 weeks in September I had a lot to catch up on. It took about a week to reply to emails, blog comments, forum posts & social media channels so it was a slow start! Now I have caught up on everything I’m pushing forward with getting my private SEO tool released and upgrading the site. And you did all this when you were on vacations. By the way I don’t see any toe surgery pictures, I have a video that you readers will love hehehehe. You are doing awesome! I’m really wanting to get more into affiliate income as well. Congrat’s! Really looking forward to the software release! What was the traffic trick on the 17th? I guess you are underestimating the WP Engine Hosting exp. Your visitors as per Google Analytics is close to 50,000 and wp engine visits are generally 20% more than this. So that makes 60,000 visits. Fantastic achievements, good for you! You mentioned adding 2 new social networks — which ones if you don’t mind? All will be revealed in due course :P But 2 that I think can fit the IM niche if attacked in the right way. Hey Matt – as always another great month! It’s really encouraging to see that what you have set up has really begun to pay for itself – as is evident with you taking a month off! Obviously, I’m a jealous bugger who’s looking forward to the day when a month off is a real possibility! I’ve also begun upgrading one of my core sites as well. After taking a long hard look at something that had far too many dead flowers, nay, dead branches and roots, I decided that a very harsh prune was necessary. Two weeks hard effort to go and then it’s gonna be time to start taking stock moving forward. I hope you don’t mind if I do something similar to you and publish a monthly income report as well? Feel free to use whatever you want from my site :) Good luck with your new venture! Thanks Matt, that’s really appreciated! I’ll send you more details once it’s on its feet! No worrys let me know when its ready to rock n rolla! Solid report Matthew! I see that you travel a lot to countries where there are a lot where the poor population is high, are you doing some sort of volunteer work? Come to South Africa next. If you already love the South you have absolutely nothing to lose! No seriously though, I’m still after some consulting next year! So keep a spot open for me please! Can’t wait to see the new software! Great work Matt and good to see you living the lifestyle in Nicaragua! I can not imagine how much would you earn if you were me and were doing what I am doing :) or if I knew as much as you know.. I really need to know but dont have any energy left to learn:) I want my customers to come just like that..with a magic stick.. without any SEO.. I am tired and wondering how come you are not! I’m not tired because I love internet marketing, its been my passion for over half of my living life! Haha thanks very much Barry! Thats the beauty of internet marketing though right? Really great report, I love how much time and effort goes into your posts. I have just started my own blogging journey and have some great posts in the pipeline about how I am making money from niche websites. Thanks very much – please let me know how it all goes! Looking at the chart at the bottom, are you concerned that your traffic is growing so well, but your income not following suit? Or is it that you need to separate out the affiliate income from consulting to tell the true story? Also, sent you a few ideas for guides via email, but not sure you received them? Or would maybe rather just interact via the forum? Nahh I don’t really care – as long as there is more traffic and more subscribers everything else is irrelevant! Looking good Matthew! Can’t wait to checkout your new tool. Care to share your favorite experience from Nicaragua? Thanks for the mention Matthew and its been a pleasure working with you. Good to see you’re killing it with your blog, very nice. No worrys thank you for providing an affordable service! Its really nice to see the various affiliates earnings for this month. Congratulation for these earnings and for considering it worthy to do all the necessary upgrades. In kingged.com, the content aggregator and syndication site for internet marketers, this post was shared and the above comment left. This is my first time on this site and I’m really delighted. Great website, great informations and I’m impressed with you and your sharing of private informations in order to help your visitors. Thanks Vukasin – hope it helps you out! Another fantastic report and income month, Matt! Question: What tool do you use to track your social shares month to month? Yeah its great value for money! Blog popularity is increasing day by day. Your site bounce rate is just 3.64% which is really great also returning visitors are very high, great. Keep it up. Great to see your affiliate earnings up allowing you the freedom away from client work. I see your domain is only 2 years old, whats your take on aged domains giving better search rankings? Hmm yeah it is strangely amazing. I’m not even sure I believe it! I’ve subscribed for your SEO tool. I am very curious about this piece of software. I’m just as interested in this. Looking forward to seeing what you have put together. This is great earning report I have ever read. Superb. Your success in short period is really mind blowing… Hats off! Waiting for your SEO tool as that might contain every piece that needs to rank a website. BTW a really great and motivating income report. I got a question regarding WP Engine. I have noticed a client of mine getting around 10,000 visits a month (according to Google Analytics) but WP Engine stats shows almost 26,000. It is something about GA not calculating everybody. I was wondering if you have experienced similar with WPEngine especially since you are now rocking almost 50,000 visits a month (congrats) and you are according to your expense still able to be on the smaller package at WP Engine; meaning WPEngine are probably not multiplying your visitors like my client. Actually this month I smashed through the barrier and with overage usage it was coming in at $155 but they let me off and I upgraded to the $99 level. I think that billing comes into effect next month. WPEngine reports from Oct 24th to now I have had 21,129 visits. Analytics says 9,106 visits, 5,727 uniques, 39,230 page views. How does that correlate with what your seeing? I have similar numbers in the sense that WPEngine shows approximately 8500 visits and GA shows approximately 3300 visits. That is a big jump which must surprise a lot of new signups. They think they can stay in a price range only to get invoiced a lot more than anticipated. Google Analytics only shows actual visitors.